I’m always telling clients about the importance of storytelling. In today’s world where people are bombarded with marketing information from every angle, it’s no longer enough to simply churn out sales messages about products or services. If you want to grab people’s attention and be memorable, you need to connect with them on an emotional level by creating meaning. People don’t just want to know what you are selling, they want to know how you are going to help them. They want to know that you understand their challenges and have developed a solution to make their lives easier or better. How can you save them time, reduce paperwork, help them to de-stress or become healthier? Understanding the concerns of your ideal customers will help you tell the stories which are likely to resonate with them most. But storytelling is not just about the product or service on offer. 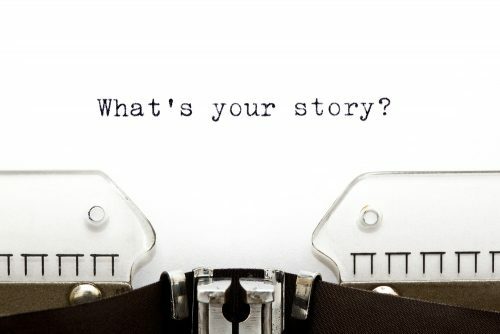 In my experience, the people behind a business often have the most powerful stories to tell. For example, you might feel a particular connection with a business because the people running it share a similar outlook or the same values as you. Maybe someone stands out because they have built the business from scratch from their garden shed, or because they have travelled the world sourcing unusual ingredients. It might be that they have met significant challenges in their life and that they’ve managed to turn things around, or that they used to work in the city and are now fulfilling a life-long ambition to do something more creative. These kinds of details add human interest to your business and can help you connect with potential customers who can relate to your story. But one word of caution, you must be authentic otherwise you will quickly lose people’s trust! Your website, social media pages, articles, blogs, photographs and other marketing materials are all opportunities to tell your story. So rather than focusing on sales messages which will switch people off, think about the problems you can help with and the experiences you have had which make your business stand out from the crowd.